69″ discharge height, 37″ projection. 45° discharge angle, 135° rotational arc. Each dump carriage operates independently. 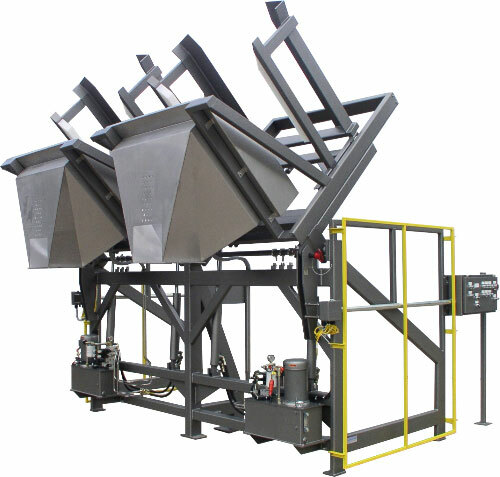 Lift & Seal System™ hydraulically docks each container to a pour hood for sealed product discharge. Unit accepts containers loaded via pallet jack. Heavy-duty tubular frame with continuous welds. Pivot carriages rotate on four-bolt nickel-plated, piloted flange bearings. 304-2b stainless steel pour hoods with 16″ square flanged outlets. Clear polycarbonate safety guarding with tubular frames on two (2) sides of the unit. Steel-It brand 316L stainless steel pigmented polyurethane finish. 5 GPM Parker hydraulic pumping unit with MTS exclusive two-speed hydraulic circuit. NEMA 12 carbon steel Hoffman brand electrical enclosure. Control panels custom built to customer’s specifications.